Don’t call Colby Mugrabi a blogger. 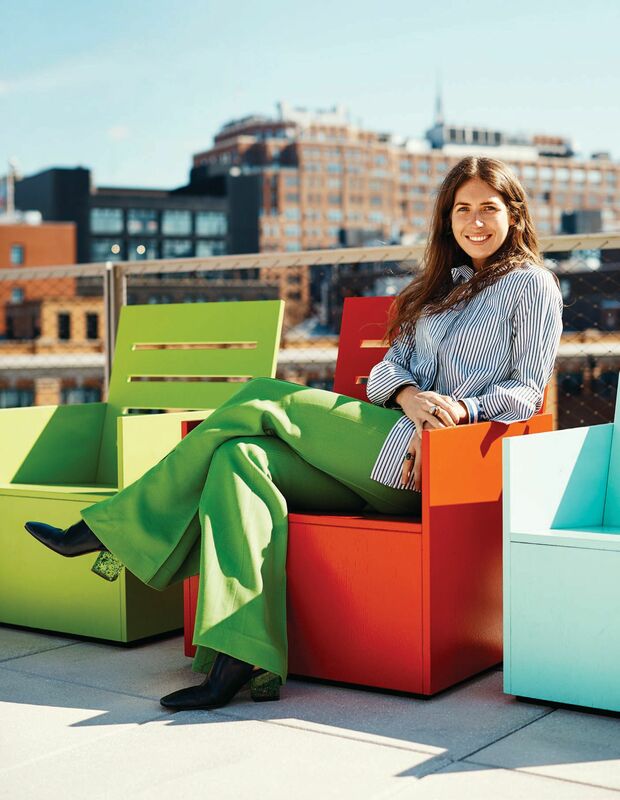 “I feel like I’m allergic to the word blog,” she says, wearing Céline pants that match artist Mary Heilmann’s chairs on a Whitney Museum terrace. “People automatically assume when it’s a content-based website run by one person that it’s a blog, but this is more of a digital digest." In the current sacrifice-to-optimize virality, fake news, and copycat culture, a scroll through the articles on Minnie Muse—a moniker plucked from her childhood career ambition to be John Galliano’s muse—and its originality is evident. “My goal is to contextualize the connections between fashion, art, design and architecture,” she says, expressing equal interest in local labels like Proenza Schouler, Le Corbusier’s buildings at the U.N. and the Calder in Gramercy Park. “I try to look at everything as a landscape, rather than a singular vertical.” Take a post drawing connections between a Comme des Garçons collection, Elizabeth Taylor in the 1967 film Doctor Faustus, Frank Gehry’s American Center in Paris, a photograph by Irving Penn and a Louise Bourgeois sculpture as another example. Minnie Muse’s credibility can be further measured by the quality of its readership, not its page view count. Jeff Koons, Lauren Santo Domingo, Dasha Zhukova, Tom Sachs, and Mary-Kate and Ashley Olsen are just a few of the thought leaders and master creators who track the site. All of whom came out to toast to her continued success this past winter at an NYC hot spot that’s the epitome of creative cross-pollination: the Ludwig Mies van der Rohe-designed Seagram Building’s Lobster Club that’s filled with Picassos and interiors by Peter Marino.